Oakwood Cemetery in Huntsville, is famous for being the final resting place of legendary Texan General Sam Houston. It is also well-known for a much less famous, much darker legend––that of the so called Black Jesus. 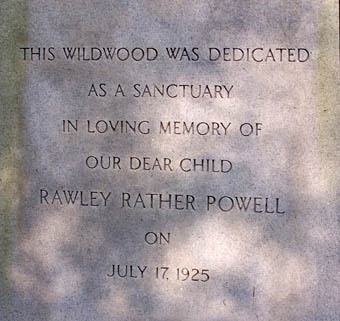 Located at the very edge of the lush, green cemetery sits a recessed wildwood erected by the Powell family in the 1920's, after the tragic passing of their 5-year old son. It is a well-tended, circular clearing with benches on either side and family graves at its center, edged by gorgeous palms and shaded by the thick forest pressing against its back. This quiet nave is dominated by a hulking, black, deeply-muscled, bearded statue that seems to watch you from every angle. This is sculpture that locals call the Black Jesus. Originally, the Jesus, with his hands turned palms-up at his sides, was a shining bronze. It wasn’t long though before the figure weathered to a inky black. According to local lore the dark color could not be cleaned away, as if the statue itself was cloaked in a blackness of mourning. Adding to the mythology of the place, the graves inside this hushed area are laid out with the feet facing toward the West, while the rest of the graveyard's occupants have been laid out in a feet-facing-East orientation. 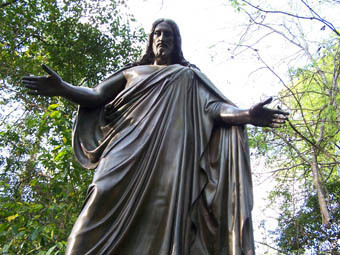 According to the legend of the Black Jesus, if you dare visit the statue at night, you just might see the position of his hands altered changed to an outstretched gesture, palm-DOWN, instead of their usual, palms-up position. We didn't get to test this eerie theory, as we visited during the day, but one thing that was weird about the statue was that the hands did seem to slightly change position from every single angle, and it also just had those kind of eyes that follows you wherever you go. We also found the verse on the right side of the base kind of strange and enigmatic. The whole clearing had a quiet, watchful vibe, even during the day, so we can only imagine how spooky the experience of encountering the Black Jesus might be been in the deep dark of night. The Stories on this site are just the tip of the iceberg. 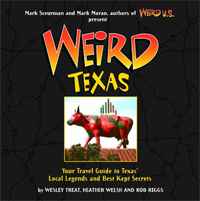 Buy Weird Texas today!